This has been a phenomenal year for The Life Cube Project, and it could not have been possible without the help of so many supporters and friends. I’ve been back from Burning Man a little over two weeks, and every time I try to list all the individuals who contributed: workers, designers, vendors, planners, vision executors and partners in virtually every phase of the project, it occurs to me that there are many more that I almost forgot. In an attempt to recognize these fine folks, I would like to document the list as best I can, and hope to add to it as my memory gets better or friends help me remember. With literally hundreds of contributors who helped in one way or another, this is likely to take a couple of entries to get right. Starting Off: First, none of what I did, do, or hope to do in the future would happen without the support of my wife and daughter, Madeleine and Natasha. From there, I’d like to start at the beginning; many of the team that has worked with me over the last four years were originally introduced to me and the Life Cube project by my good friends, Tigger and Niobe. And the first Fire Safety Experts included Gordy and Christian, along with the support of many of the friends from Camp Titicaca who celebrated the first burn and made a perimeter to insure that nobody was hurt. Design and Build: On the construction side, Mark was our chief carpenter and a magician with wood in both 2012 and 2013, and this year brought on Aaron and Toby, who are master carpenters and worked both pre-Burning Man and on the playa to build a very strong, stable, and solid installation. And there was Jerry from Texas who added his outstanding carpentry skills too. We’re grateful to Courtney, a last minute add to the Cube team, who not only brought her welding skills for rebar bracing, but was always on site to help whenever someone needed an extra hand. And to Mike, who was on the team in 2012, and stepped up to be an amazing add to the construction crew this year. Kevin and Cristina of dsb+ Architecture & Interiors were enthusiastic Life Cube boosters, who donated their time, architectural creativity and knowledge, taking what was in my head and putting it into formal plans, blueprints, and CAD drawings. The Burn: Christian, Gordy, Elliot, and Jay took major responsibilities this year in helping burn the Cube in a safe and stunning fiery blaze. And the fire-spinners that practiced their craft at the Cube last year and this year pre-burn were just spectacular. Burning Man: The people involved in the Life Cube project now number well over 100, and that is not including the 800+ donors who contributed money, equipment, time, and materials. And none of what happened at Burning Man could have happened without the help, encouragement, and growing support of the Burning Man organization, specifically including Bettie June, Maria, and Brody, the Artery, DPW, Heavy Equipment Group, Artist Support Services, and the FAST Team. Ben at the Artery helped us coordinate resources, took late night and early morning calls, and worked out some last minute problems; his counsel was invaluable. Also, many of the other BM artists helped out in a pinch with tools or materials, advice and expertise. The Generator: This year, we especially have to recognize The Generator in Sparks, NV, which offered our project a warm welcome and generous space for pre-playa construction. There were Matt, Andy, Ira, and Roger at the Generator, and the many other artists who made it easier for us with their referrals, suggestions and encouragement. Special thanks go out to Trevor for taking on additional responsibilities to coordinate volunteers and vendors. Photography: Niobe volunteered her time and professional expertise to work with all the photographers that donated their amazing photos of Black Rock City, going all the way back to the first Burning Man, including Scott London, Tomas Loewy, Stewart Harvey, George Post, Barb Traub, Tom O’Neill, Kim Roseberry, and Matt Freedman, plus some of Niobe’s own fantastic work. And thanks also go out to Mayumi, who helped organize and lay out the photos for the printer. Many of these, and other photographers and videographers as well, recorded special moments during the many phases of this year’s Cube. Special note to Andrews (Jov), who has taken enormous time and made use of his extraordinary talent to document (both with still photos and video) the burns over the last three years. Some day, we might make a documentary about the Cube in these early years, and his footage will be instrumental in telling the story. Visual Arts: Angelina Christina, a fantastic muralist, with her team Jessica, Heather, and Richard, created a spectacular addition to the Cube in 2013. And there were over 120 friends and artists from around the world, who each painted a panel for the Tapestry Wall, too many to name individually (and I don’t even have everyone’s name! ), but who created a mosaic that was so beautiful. Navid was invaluable working with us on documenting & assembled the Tapestry Wall and photo-boards (along with Thomas and Linda). JT and Susan introduced sacred geometry, which both added to the design and attracted even more people to interact with the Cube. Party and Provisions: I can not begin to thank Jay and Donna for all they did this year – including both electrical skills to assist Trevor, artistic talent to help with signs and design, and the abundance of delicious food they brought and prepared to feed volunteers on the playa construction team. We’re grateful to Lori, David, and Kim, who worked on the Cube pre-Burning Man, and helped with the Cube Party at the Sands. Lori made sure there were supplies and a plan for the party, and was also invaluable in decorating the Cube this year. Web and Graphic Design: Thomas redid The Life Cube website (now that was a pleasant surprise! ), and assisted with the Cube’s Facebook page. Dan created a new logo and the design for this year’s official wish-sticks this year; Julio created the Cube’s aesthetic exterior design and our wish-sticks in 2012. Our Vendors: Among the most supportive of all the vendors were RB Technologies, which printed our wish-sticks, and Truckee-Tahoe Lumber Co/Home Concepts, which sold us materials for the project at cost. Lisa and Ferenc at the Sands Hotel were incredibly supportive as well, providing us with rooms for our crew’s overnights and space for the art party in the weeks leading up to Burning Man. Neil at Skyline art supplies gave us a link and special pricing for canvases, and there were numerous other vendors and suppliers for lighting, paint and hardware, beads and crafts, chimes, and a million other elements that went into creating this year’s Cube. More Helpers: Jeff offered his contacts and advice. Arthur, Yaniv, and Ryan led the clean-up of the site and made sure that we LNT. Others that have been involved in no small part in making the Cube a success included the original build team (2011) of Ben, Eric, and Anastasiya. And that first year, Arthur and Dominique carried the message far and wide throughout Black Rock City, for its citizens to write down their wishes, dreams, or aspirations and deposit them into the Cube. I can’t forget Hank and Swami for adopting me into the Camp Titcaca family. Many added thanks for a variety of good works and contributions go out to Curtis, Charlie, Matt, Roger, Ben, Dave, Jeff, Elliot, Adam, Barb, Beer, Benjamin, Betsy, Chris, Duff, Dennis and his 53’ flatbed truck, Eric, Arlo, Erik, Mimi, Frank, George, Jennifer, Kathy, Joe, John, Kirk, Susan, Kit, Kristie, Ladd, Lori, Lauri, Leah, Linda, Marc, Toby, Mimi, Tom, Mike, Maria, Christian, Christopher, Ryan, Chip, Jeff, Rick, Steven, Jake, David, Ty, Masha and her First Wednesday crew, Jodie, Brian, Lisette, Aaron, Annie, Ariel, Todd, Alan, Stephen, Jeff, Pamella, Michael, Joe, Andrew, Stu, Ron, Leah, Raymond, Abbie, Tizzle, Sally, Josh, Brian, Justin, Jason, Lior, Karl, Richard, Pani, Sara, Danny, Elisabeth, Lee, Pam, Alan, Mia, Jerry, Nancy, and the many more as yet unnamed that I know that I have inadvertently failed to remember or acknowledge in this post. 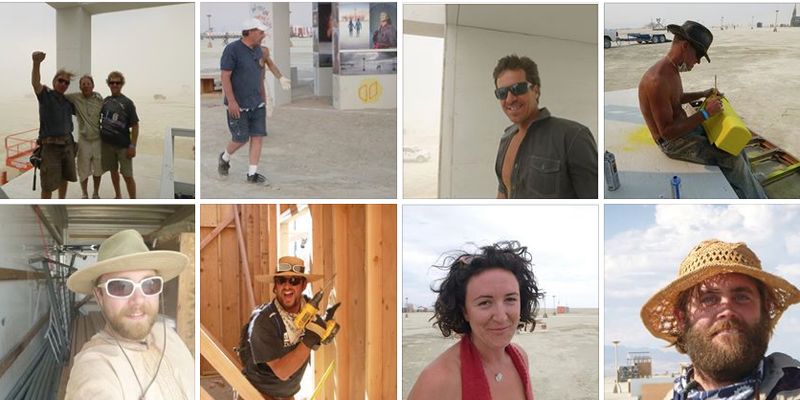 Last, those of us on the Life Cube project team are all grateful to the Citizens of Black Rock City – for without their contributions, interaction, and participation – the Cube would have never have succeeded and grown beyond our wildest expectations. To all the above, every one of you, I want to say thank you! Thank you for your time, your friendship, your help and your dedication to making The Life Cube a dream come true. This entry was posted in ENVISION: The Life Cube, Pictures & Videos, The Life Cube Project and tagged art + burning man, art at burning man, art project at burning man, black rock city, BM2013, brc13, Burning Man, Burningman, cargo cult, ENVISION: The Life Cube, life cube, life cube project #lifecube #thelifecubeproject #lifecubeproject art, lifecube, lifecubeproject, skeeter, The Life Cube, the life cube art project at burning man, TheLifeCube, wish cube. Bookmark the permalink.